Asetek presents a new universal mounting solution that supports Intel's future Sandy Bridge E processors. Asetek, the world’s leading supplier of liquid cooling technology for computers, today announced support for Intel’s next-generation high performance desktop platform processor, codenamed Sandy Bridge E, across Asetek’s line of all-in-one liquid CPU coolers and combination CPU+GPU coolers. Sandy Bridge E is unlocked for performance tuning and utilizes Intel’s new socket 2011. 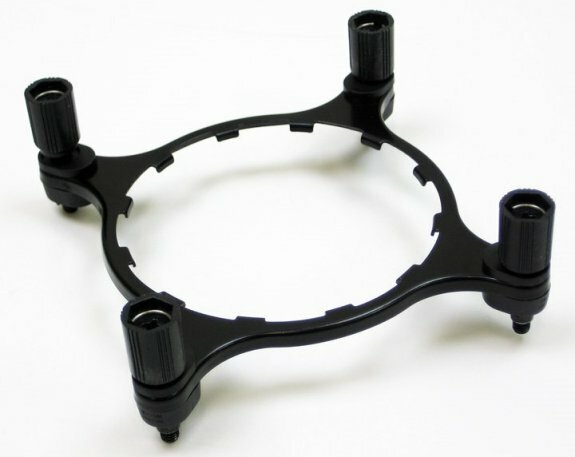 Support for the Intel Sandy Bridge E is enabled by a new universal mounting system that is compatible with all of Asetek’s all-in-one CPU liquid coolers. In addition to supporting the new Intel socket 2011, the redesigned mounting mechanism supports all popular Intel processors that utilize LGA 1155, 1156 and 1366 sockets. Samples of Asetek’s Sandy Bridge E mounting solution will be available for qualification by OEM and systems integration customers beginning June 10th, 2011. Partner Products for do-it-yourself and enthusiast customers are expected to begin reaching store shelves in August. Owners of Asetek manufactured all-in-one liquid cooling systems that upgrade their PCs to Sandy Bridge E processors will be able to purchase Socket 2011 mounting kits from Asetek’s partner brands or complete mounting solution kits from Asetek. The complete mounting kits support popular desktop processor sockets for both Intel and AMD processors.